I have been gone for awhile, ok a long while, and decided to come back and post up my build up of my new BOV. 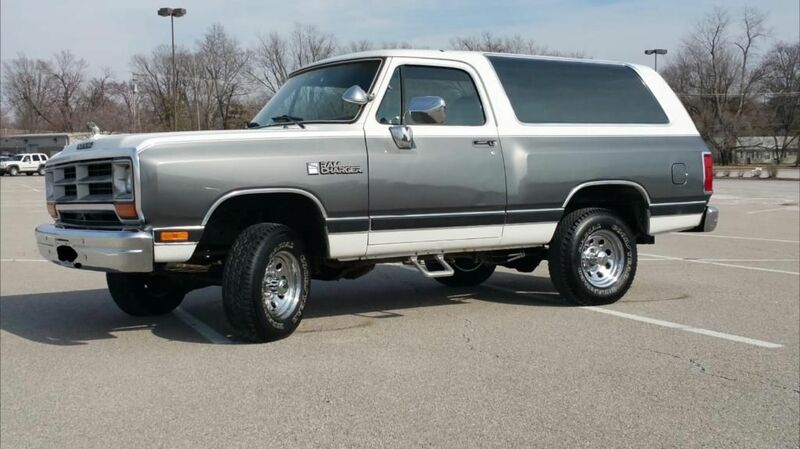 It is a 1985 Dodge Ramcharger Royal SE Prospector. 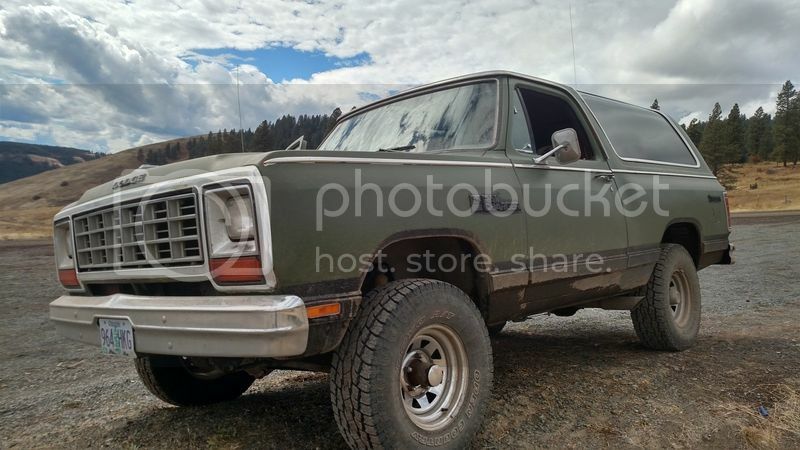 Running gear includes a 318 (2bbl non computer carb), auto transmission, Dana 44 front and Chrysler 9.25 rear. I picked the rig up in Idaho from a seller originally wanting $3000 for it, after being patient and waiting months I finally went to go see it after I had talked him down to $2000 without even seeing the rig in person. When I got there the tires were completely dry rotted and unsafe for travel and I got him down to $1200. Not bad considering the only damage is a dent in the passenger side rocker and paint cooked by the desert sun. When I got home I was able to dig in a bit more, every hose and belt under the hood was new. After getting a new set of tires (Toyo ATs) I was able to drive home at 70-85mph without a hitch. The rig lived its entire life in Nevada and Idaho. The paint was completely cooked off the hood and roof. 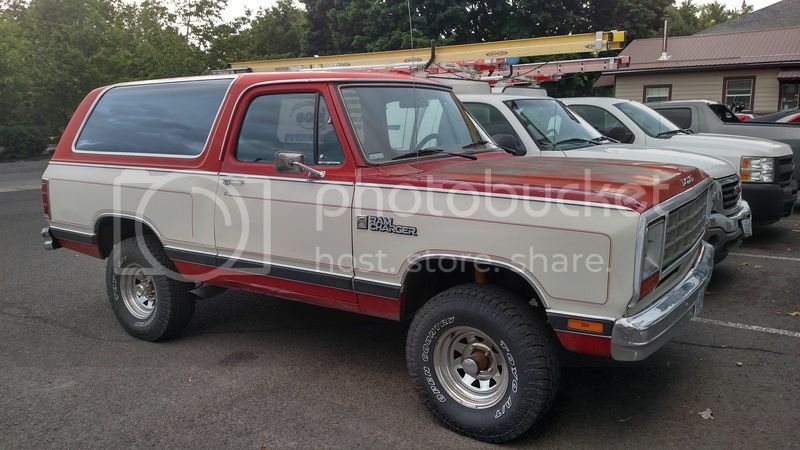 That would need to be resolved bringing it back to Oregon so this rust free example would stay that way. I had decided to use paint from a military vehicle restoration company. Originally I was thinking either a desert tan color or a gray color. However I left the choice to my wife and she chose the current OD green. I went with this paint for a couple reasons, one it was cheap 2 gallons delivered was just over $100, two it is tough as nails and can handle the abuse of being on the trails, the third and final reason is it is a non glossy paint and even though it screams prepper in other areas out where I live it blends in with the other mountain/hunting rigs. Another benefit of this paint was it was possible to apply a thick coat using rollers instead of paint guns. The rockers were also coated in Herculiner to help keep the rockers from rotting out and additional protection. Both the paint and Herculiner took 2 days of work in my buddies shop doing prep and the actual work. We then left it in his shop for a week to allow time for the paint to harden up. This had to be a quick job so we could get the rig protected before winter hit. There are details that still need taken care of, door jams, under the hood, behind the grill all need paint. The remaining chrome pieces and trim will be blacked out. I will also be coating the inside of the wheel wells and the inside floor with bed liner. Most of this should hopefully be completed before next summer. For the winter it will also undergo some other work as well. A new overhead mount for the CB and fixed antenna with folding mount, a new roof rack will be built for it and basket attached along with auxiliary lighting (all side, independently switched). I will also be building a retractable awning to pull out from the passenger side and a rear cargo organizer. I have new interior panels for the sides that will add rear speakers (gotta have the tunes), the driver side will be reinforced to allow an axe and shovel to be hung on the panel. I have a set of front seats out of a newer Jeep Wrangler to replace the non adjustable seats that were stock in the Ramcharger. The headliner will be recovered (its sagging) and interior panels will all be repaired and recolored (gotta get rid of that red). I already have seat covers from Cabelas that are black with ACU camp centers and have MOLLE attachments on the back (Christmas present from the wife last year). I will be installing new window and door seals and additionally sealing for the rear windows and the top vent panel. Sole member of the East Oregon Independent Contingent. Looks nice. Were it mine I'd black out all the rest of the chrome but that is just me. I would not bother recovering the headliner. Often times you can buy a new one for cheaper and with less hassles. The new one will also last much longer as it is made with modern materials. You can normally get 300K+ out of a 318 engine. They were one of the good ones. Yeah I fully intend to black out all the chrome it just sticks out WAY to much with the flat color of the green. I decided to leave the trim pieces on for now to reduce the look as a military rig what with the color and all. Yeah tons of life left in this lil 318 so it should hold me until I get funds together for a Cummins swap. I see those dual exhaust tubes you aren't sneaking by anyone. Why not go the other route. Make the whole thing Chrome. It just now has 120,000 original miles. It was the fire chief's truck for a fire department about 60 miles away. What is grey in that pic was originally the bright safety green color. I am the 4th owner. I bought it in January 2015, with 84,000 miles on it. A lift kit and bigger tires are in the future. Mine also has the 318 and an auto transmission. I am with you on moving the spare to the outside, like on the Bronco's....and maybe a "jerry can". To really trick it out, I'd like a roof basket. Back up lights at night are absolutely anemic, so a light bar fore and aft would be ideal. The Twizzler wrote: I see those dual exhaust tubes you aren't sneaking by anyone. Why not go the other route. Make the whole thing Chrome. Those are on the list to change one because they are loud and second when sitting still the exhaust comes in open windows badly.